I’ve been playing Breakout-esque games for decades now, and despite the fact that they’ve fundamentally remained the same, they still do the trick every so often when I’m craving an arcade-like retro experience. Sure it’s a score-attack-based affair, with a dangling carrot that will never actually be reached, but at the very least, you can still break out all of those bricks and move on to the next set of tiles. There’s a sense of progression to it and a noble air of simplicity that makes the genre so alluring. 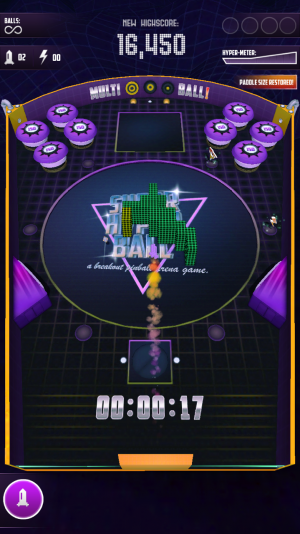 Super Hyper Ball (Free) maintains the same classic feel as those titles, but adds in a few rudimentary aspects of pinball into the mix. With two modes to choose from at the start, Hyper Ball is super easy to pick up. You’ll be able to jump in by way of a story mode (read: multi-leveled setup), or endurance mode, which eliminates the player by way of time and a “one strike, and you’re out" rule. Beyond that, seven brief challenges await those of you who attain specific letter rewards in the story mode. When I said that the pinball influences are rudimentary, I meant it. There’s a few bits up in the corners that function as bumpers, and bumpers on the lower side. There’s no flippers in sight though, as the main method of controlling the action is through a bar at the bottom, which can be dragged across the screen at will. There’s a tiny little deadzone at the bottom that works, but might get a touch uncomfortable for those of you with big fingers. At times, I crowded the screen and ended up losing track of my bar momentarily. The core gameplay however, is engaging enough to make up for the lack of ingenuity or slightly off controls. There’s plenty of goals to go for in addition to the blocks at hand to smash, and power-ups are constantly dropping onto the board to pickup. 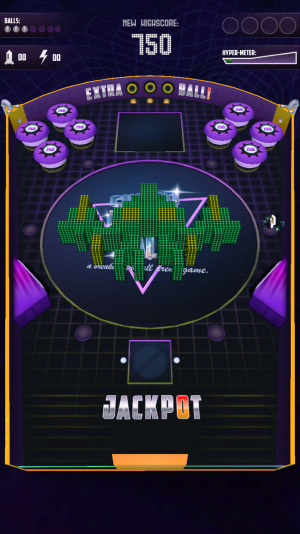 These range from pinball-esque multi-balls to rockets, which can be fired off with the tap of a virtual button near said deadzone. I really like the constantly interactivity involved, as you’re not simply watching the ball shoot about, and you have quite a bit of control over its direction. Aesthetically, the game retains that classic Microsoft 3D Pinball look (you know, the one that came standard with Windows for years), and I really dig it. Sometimes the purple can be a bit much, but it has just the right hue to it where it isn’t too overbearing or annoying. Also, the defined borders and outlines of all of the bumpers and objects make it easy to discern where you want to hit next. Even on a small screen the UI is well-crafted too, as you can clearly view what power-ups you have at your disposal, and how far away you are from topping your latest high score. Super Hyper Ball is a free download, supported by ads, with the power to remove them for $2.99, and instantly unlock all challenges for $1.99. Videos only show up after losing a round, and while intrusive, are brief enough where you can get back to the next set without wasting too much time. Additionally, players can watch ads at the beginning of a round for a start bonus (read: an extra ball). In the end, it’s worth the few bucks to essentially trade up into the premium version. Previous PostPrevious Apple Nukes App Store Wish Lists Because… Reasons? Next PostNext The Ruined City Wing of League of Explorers in ‘Hearthstone’ Now Open!